It was nine years ago that Brian Briggs first met Jon Quin, at a Freshers Week at Oxford University. Brian’s first words to Jon were that he looked like a member of Scottish indie rock band Teenage Fanclub. That broke the ice. Brian and Jon realised they both shared a love of music. So, they started making music together. Soon, Brian and Jon decided to form a band. With Brian a guitarist, and Jon a keyboardist, this meant they were looking for a rhythm section. So, like several generations of bands before them, they placed an advert, and waited. Eventually, bass player Oli Steadman replied to the advert. He was the only person to reply to their advert. Oli was auditioned, and joined the nascent group. Soon, so did his younger brother. The as yet unnamed band consisted of bass, guitar and keyboards. They needed a drummer. Fortunately, Oli Steadman’s younger brother Rob, played the drums. Rob Steadman was asked to audition, and became the final piece in the musical jigsaw. All the band needed was a name. For some bands, naming a band can be a tortuous process. That was the case with Brian, Jon, Oli and Rob’s nascent band. All they knew was that they wanted to name their band after a town. Not just any town though. It had to be a town that was “a bit remote and coastal.” This gave them plenty of scope. So they settled down, and waded through a huge list of names of coastal towns. At one point, the band even took to studying books about the weather. Names were considered. None seemed to fit. Eventually, though, Brian, Jon, Oli and Rob settled on Stornoway, a town on the Outer Island of Lewis. It was the only name that seemed to work. What’s more it was a name everyone knew. Every time the BBC weather forecast is broadcast, the name Stornoway is mentioned. For Brian, Jon, Oli and Rob this they joked, was like to a free advert. It seemed that already, Stornoway were thinking big. That’s despite their career being in its early stages. After less than a year together, Stornoway had put together a demo tape, The Early Adventures Of Stornoway. It included I Saw You Blink, which was played on the BBC Oxford Intorducing program in March 2006. This was the first time Stornoway were heard on radio. Their radio debut was well received. Stornoway were on their way. Three years later, Stornoway caught a break when they featured on Radio 1’s Big Weekend. It was held at Lydiard Park, Swindon. That day, saw Stornoway winning friends and influencing people. This inspired Stornoway to self-release their debut single Zorbing in July 2009. For Stornoway, this was just the start of a magical summer. Right through the summer of 2009, Stornoway’s music was being heard by a much wider audience. Their finest hour came at the Glastonbury Festival. Stornoway played six times over the three day Festival. Then as summer became autumn, Stornoway headlined a show at the Tate Modern, London on the 1st of September 2008. It highlighted the climate change campaign. For Stornoway, this was a defining moment in their career. No longer were Stornoway were one of music’s best kept secrets. They were one of British music’s rising stars. Later in September, on the 29th, Stornoway released their sophomore single Unfaithful. So, a launch concert was held at the Institute of Contemporary Arts, in London on the 21st September 2009. Eight days later, Unfaithful was released on CD, 7” single and as a download. Stornoway it seemed were going places. To promote Unfaithful, Stornoway headed out on tour. Between the 16th and 30th October 2009, Stornoway toured Britain, spreading the Stornoway gospel. Then a month later, Stornoway caught the biggest break of their three year career. Stornoway were asked to appear on the BBC TV show, Later…With Jools Holland. They became the first unsigned band to appear on the show. Their appearance on the show hugely increased their profile. Suddenly, millions had heard of Stornoway. This resulted in Stornoway featuring on the long list to the BBC’s Sound of 2010 competition. It seemed Stornoway could do no wrong. As 2010, got underway, Stornoway headed out on another tour of Scotland and Ireland in March 2010. For the first time, Stornoway played the place they were named after. This was akin to a spiritual homecoming. It was also a cause for celebration. No longer were Stornoway one of Britain’s best unsigned bands. They had signed to indie label 4AD, and released their third single their third single, I Saw You Blink on 22nd March 2010. Two months later, after four years hard work, patience and persistence Stornoway released their debut album, Beachcomber’s Windowsill. Even before they signed to 4AD, Stornoway were busy recording their debut album, Beachcomber’s Windowsill. It featured eleven eleven tracks. Brian penned eight tracks, and cowrote two with Jon. Stornoway’s principal songwriters also produced Beachcomber’s Windowsill, which was released on 24th May 2010. On its release on 24th May 2010, Beachcomber’s Windowsill was well received by critics. Most of the reviews were positive. That’s not surprising, as Stornoway were already a reasonably well established band. The critics knew what to expect of them. By then, Stornoway’s fusion of folk rock and indie rock had won over critics. Soon, Stornoway were winning over British record buyers. When it was released, Beachcomber’s Windowsill charted at number fourteen in the UK album charts. Soon, Beachcomber’s Windowsill had sold in excess of sixty-thousand copies. This resulted in Beachcomber’s Windowsill being certified silver. That wasn’t the end of the success for Stornoway. Although I Saw You Blink had only reached number 119, in the UK top 150, it reached number twelve in the UK Indie Charts. Then Zorbing was re-released as a single. It and reached number seventy-four in the charts and number four in the UK Indie Chart. However, word was spreading about Stornoway. Zorbing gave them a number eleven hit in Belgium. Stornoway were on their way. After the release of Beachcomber’s Windowsill, Stornoway headed out on tour. They returned to Glastonbury, and later played at the Womad Festival. Soon, Stornoway were heading of on a tour of Germany. This was the second time Stornoway had played in Germany. Just like the first, it proved a success. So, buoyed by the success of their German tour, later in 2010, Stornoway headed to Italy, Luxembourg and Switzerland. Stornoway took the three countries by storm. It was the perfect way to end what had been the biggest year of their career. As 2011 dawned, Stornoway announced their touring schedule. This included a third appearance at Glastonbury, one of many festivals Stornoway played at. However, their first concert of 2011 took place at Somerset House, in London. That set the ball rolling for Stornoway’s summer. By September, Stornoway were ready to return home. Stornoway played a gig at the Regal, in Cowley Road, Oxford. After this, Stornoway’s thoughts turned to their sophomore album Tales From Terra Firma. For Stornoway, most of 2012 was spent in the recording studio. A total of nine songs were recorded. They became Tales From Terra Firma. Just like their debut album, Brian wrote most of the songs. He penned seven of the songs, and cowrote one with Jon. The only song Jon wrote himself was Knock Me On The Head, one of Tales From Terra Firma’s highlights. However, there’s more to Tales From Terra Firma than one song. Throughout Tales From Terra Firma, elements of folk-rock, indie pop, jazz and psychedelia melt into one. It’s a potent, enthralling and mesmeric musical fusion. So, it’s no surprise that Tales From Terra Firma won over the hearts and minds of critics and record buyers. Tales From Terra Firma was scheduled for release on 11th March 2013. To give Stornoway’s loyal fans a tantalising taste of their forthcoming album, Knock Me On the Head was released as the lead single on 1st January 2013. This hook-laden single was the perfect amuse bouche to Tales From Terra Firma. When Tales From Terra Firma was released on 11th March 2013, it was to critical acclaim. This time, there were no dissenting voices. Each and every critic was won over by Tales From Terra Firma. Great things were forecast of Stornoway’s sophomore album. On its release, Tales From Terra Firma peaked at number twenty in the UK Album Charts. Given the reviews, and the undeniable quality of Tales From Terra Firma, this was somewhat disappointing. Following the release of Tales From Terra Firma, Stornoway embarked upon a gruelling world tour. Nobody thought that Stornoway would release any more music during 2013. They were wrong. In September 2013, Stornoway surprised their fans by announcing they were releasing a mini-album, You Don’t Know Anything. It featured outtakes Tales From Terra Firma. You Don’t Know Anything was released to coincide with Stornoway’s British tour at the end of 2013. The release of You Don’t Know Anything showed that Stornoway were a group thoroughly in touch with the modern music industry. Stornoway, realising that that music industry was constantly changing, decided to make use of the latest innovations. Allmusic were given the exclusive rights to stream You Don’t Know Anything. Rolling Stone magazine offered a free download of Tumbling Bay. So did BBC Radio Six’s Lauren Laverne. All this was great publicity for Stornoway. Their star was in the ascendancy. So, as 2013 drew to a close, Stornoway released another single Tales From Terra Firma, Farewell, Appalachia. It was accompanied by a video directed by Matt Cooper, whose a member of another Oxford Band, Spring Offensive. The release of Farewell, Appalachia brought the biggest year of Stornoway’s career to a close. 2014 would be another busy year for Stornoway. By June 2014, Stornoway were in the midst of one of the busiest periods of the year. They had toured Britain, and were just about to embark upon the busiest period of many band’s year, the festival season. That’s when Stornoway announced their intention to use crowd funding to fund their third album Bonxie. Like many bands before them, Stornoway had decided to use the PledgeMusic crowd funding site. That’s where initially, copies of Bonxie would be available from. Within just four days of the announcement, Stornoway had 222% of their target funding. With the money raised, Stornoway could enjoy the festival season safe in the knowledge that they had already funded Bonxie. Once the festival season was over, Stornoway began work upon their third album Bonxie. Eleven tracks were written by Brian Briggs and Jon Quin Stornoway’s two principal songwriters. These tracks were recorded by Stornoway, with the help of producer Gil Norton, whose previous credits, include the Pixies and Foo Fighters. For Stornoway this was a first. Never before had they brought onboard a producer. Brian and Jon were already experienced producers. So, this caused more than a few raised eyebrows. Would Gil Norton’s inclusion change Stornoway beyond recognition. It was a case of wait and see. As recording began, Jon played guitar, Brian keyboards and the Steadman brothers Oli and Rob played bass and drums respectively. Just like their two previous albums, other musicians were brought in to add textures and colours to Bonxie, which is the Shetland nickname for the Great Skua. It’s a quite magnificent, but some would say terrifying seabird, that’s found in northern climes. The Bonxie will be familiar to Stornoway, who have never hid their love of wildlife. Its picture sits proudly on Stornoway’s third album, which was released on 13th April 2015. Just like their sophomore album, Tales From Terra Firma, Bonxie was released to unequivocal critical acclaim via Cooking Vinyl Records. Many critics hailed Bonxie as Stornoway’s finest album. Is that the case? Birdsong gives way to a the sound of a boat leaving the harbour on Between The Saltmarsh and the Sea, which opens Bonxie. As it drops out, there’s near silence, just a brief burst of birdsong. Then maudlin keyboards play, setting the scene for Brian’s thoughtful vocal. In the distance, retro drums inject a sense of urgency. Soon, the arrangement unfolds. Stornoway’s rhythm section, guitars and keyboards envelop Brian’s vocal. It veers between needy and grateful, to heartbroken. Deep down, Brian is suspicious, wondering where his lover goes when she leaves him? His vocal grows in power, and is filled with emotion and confusion, as he delivers this beautiful, soul searching ballad. Straight away, it’s obvious that the hooks haven’t been spared on Get Low. It’s a delicious fusion of influences, including indie pop, folk rock, Americana and Nu Country. There’s a nod to The Jayhawks and Wilco. As for the synths, they have an eighties sound. They drift in and out. Mostly, it’s Stornoway’s rhythm section, guitar and harmonies that are at the heart of everything that’s good. Especially, when combined with Brian’s vocal. Together, they play their part in a glorious hook-laden anthem. The sound of city life opens Man On Wire. It paves the way for Stornoway’s thunderous rhythm section. Oli and Rob Steadman never miss a beat. They’re accompanied by Brian’s searing, chiming guitar. Atop the arrangement sits Brian’s vocal. He combines power and emotion. It’s a cathartic outpouring of his feeling. Soon, strings are added. They prove the perfect addition, filling in the gaps and adding texture. The strings dance their way across the breakdown. By then, Stornoway are well on their scoring a home run, on this fist pumping anthem. Just a plucked guitar opens The Road You Didn’t Take. Brian’s vocal is accompanied by close harmonies. His vocal is rueful, at what he sees as missed opportunities. He ponders “The Road You Didn’t Take.” Meanwhile, ethereal keyboards, drums and wistful strings are added. However, it’s Brian’s vocal and the harmonies that grabs your attention. It’s as if he’s lived and survived the lyrics. You’re captivated by his delivery, right through to the arrangement reaches its dramatic crescendo. Lost Youth marks a change in style from Stornoway. It’s a musical potpourri of influences. There’s everything from indie pop, folk-rock and even the merest hint of reggae. An acoustic guitar gives way to synths and sound effects. Stabs of drums are added as Brian delivers an urgent, questioning, vocal. He sings of a boy struggling to become a man. He’s confused, struggling to come to terms with adulthood, and who and what he is. That’s apparent from the lyrics: “we know just what we want, but we don’t know how to describe it” and “we don’t know where we stand, but we think we know what we stand for.” As Brian delivers his vocal, the bounding bass, chirping guitar and dancing strings sweep in. Just like previous tracks, there’s hooks aplenty, as we hear another side to Stornoway. We Were Giants has a country influence. It’s the guitar and washes of atmospheric music that lead to this comparison. So do the lyrics. They’re cinematic, delivered wistfully by Brian. He sometimes, sounds not unlike Al Stewart. Ruefully he remembers: “tell me of the time we could walk for miles on roads to nowhere…when we were happy to stagger through the fields to the lights of the house.” As Brian paints pictures, the rest of Stornoway add colour to the arrangement. Strings sweep, drums are played with brushes and bass helps drive this beautiful, but rueful ballad along. Melancholy describes the introduction to When You’re Feeling Gentle. However, Stornoway are just toying with you. Soon, an electronic arrangement unfolds. It’s best described as electro-folk with a rocky hue. As the arrangement is propelled along, Brian delivers an urgent, needy vocal. Harmonies accompany him. Later, when the arrangement is stripped bare, Brian’s vocal oozes emotion. His vocal is then swept along by a glorious wall of sound. This is akin to a call to dance, once that’s truly irresistible. A lone Hendrix-esque guitar opens Heart Of The Great Alone. It’s joined by the rhythm section and winds its way through the arrangement. Having set the scene, Brian’s vocal enters. It’s thoughtful and emotive. This is the signal for the arrangement to slow down. In doing so, Brian’s vocal becomes the focus of your attention. He delivers a heartfelt vocal, before the arrangement takes on a trippy, psychedelic sound. Then a blistering rocky guitar is unleashed, as this genre-melting track reaches it dramatic finale. Brian sings unaccompanied on Josephine. Soon, harmonies and a strummed guitar and walking bass join him, as he delivers an ultimatum. He sings: “it’s now or never for me,” on this beautiful folk-tinged ballad. Guitars, keyboards, bass and handclaps open Love Song of the Beta Male, the closing track on Bonxie. They grab your attention. Soon, Brian’s vocal enters. Thunderous drums accompany his vocal. It’s as if he’s suffering from a crisis of confidence. He feels like he can’t do anything right. That’s apparent when he sings: “don’t ask me to sweep you up and carry you across the threshold, I’d only hurt myself.” As the arrangement unfolds, it grows in drama. Strings are added and drums continue to pound, as an insecure Brian delivers lyrics that are cerebral and witty. They play their part in a rueful track that’s tinged with sadness and humour. Two years after the release of their sophomore album, Tales From Terra Firma, Stornoway return with what’s without doubt, the best album of their career, Bonxie. It features eleven tracks of hook-laden music. Bonxie it appears, is a coming of age from Stornoway. Hook heavy anthems aren’t in short supply on Bonxie. Two of the best are Get Low and Man On Wire. They’re sure to be festival favourites during the summer months. Then there’s Bonxie’s soul-baring ballads like Between The Saltmarsh and the Sea, We Were Giants, The Road You Didn’t Take, Josephine and Love Song of the Beta Male. Apart from ballads and anthems, Bonxie features When You’re Feeling Gentle, an irresistible call to dance. It seems, there’s something for everyone on Bonxie. That’s no surprise. Stornoway combine everything from Americana and country, to electronica, folk, folk rock, indie pop, indie rock, psychedelia and rock. Musical genres melt into one. So do influences. Everyone from Fairport Convention, R.E.M. and Teenage Fanclub to The Beatles, The Jayhawks and Wilco seem to have influenced Stornoway. Their influence can be heard during Bonxie, Stornoway’s career defining album. Everything, it seems has been leading up to Bonxie, Stornoway’s third album. Bonxie is the best album of Stornoway’s career, and should transform their fortunes. It was released via Cooking Vinyl Records, to widespread critically acclaim. That’s no surprise. After nine years together, Stornoway’s time has come. 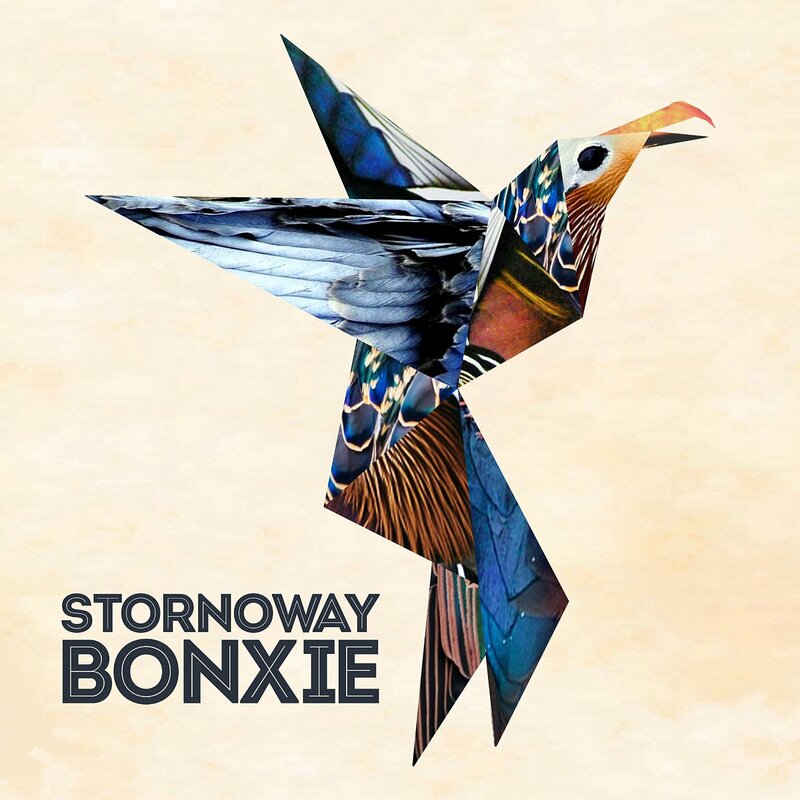 It’s time for Stornoway, one of the most exciting and talented British groups, to step out of the shadows, and enjoy the limelight with Bonxie, an album of hook laden, genre-melting music. ← EDDIE BO-BABY I’M WISE THE COMPLETE RIC SINGLES 1959-1962.